Barbizon artists had no agreed-upon style, but were revolutionary because of their commitment to portraying nature as a worthwhile subject in its own right rather than something that was so remote that it could only be expressed through romanticized and sublime images. In other words, nature was something that could be experienced personally and painted subjectively and not just romantically or philosophically. Barbizon School painters often included toiling peasants in their landscapes---persons who had little time or inclination towards 'contemplation' of nature. This approach was also revolutionary in prevailing approaches to fine art, which showed preferences for genteel subjects such as aristocrats basking in the beauty of their surroundings. Barbizon artists are considered the first "plein-air" painters, those who painted directly in the outdoors rather than completing their scenes in studios from sketches. Chief among the original French Barbizon painters were Camille Corot, Francois Millet, Theodore Rousseau, and Charles Daubigny. American painters much influenced by the Barbizon School were George Inness, Homer Martin, Alexander Wyant, William Morris Hunt aand Wyatt Eaton. Eaton and Hunt lived near Millet at Barbizon. Sources: "The Britannica Encyclopedia of American Art"; Kimberley Reynolds, "Illustrated Dictionary of Art Terms"
The term Barbizon refers to a style of plein-air landscape painting that combines elements of Tonalism, Impressionism and The Munich School. Scenes are peaceful in agrarian, bucolic settings, and sometimes have farm animals and/or peasant figures. However, the overall mood is not tranquil because shadows and monochromatic dark colors, blurred features such as trees and streams suggest ongoing sadness or tragedy. In the 1830s a group of French naturalist painters originated Barbizon painting when they left their studios to paint directly with their easels in landscape in the village of Barbizon on the outskirts of the Forest of Fontainebleau. Most of them had a background of academic training in Paris, but in Barbizon they had no rigid agreed-upon style and no particular commitment to rebellion. However, in art history, Barbizon artists are credited as being revolutionary because of their painting directly from nature, their choice of landscape as the primary subject, and their emotional involvement in the process that is evident from the tone of their canvases. In other words, nature was a worthwhile subject in its own right rather than something vague, romanticized and sublime. And for the first time in paintings by reputable artists, working peasants were depicted, a subject that was also startling because it was a turn from gentle subjects that opened the door to the 20th Century movement of Social Realism. Adopting a new philosophy that man cannot be separated from nature, Barbizon artists created works that drew the viewer into the scene, not as a bystander but as active participant. Chief among them were French artists Camille Corot (1796-1875), Jean Francois Millet (1814-1875), Theodore Rousseau (1812-1867), and Charles Daubigny (1817-1878). Winckworth Allen Gay (1821-1910), a student of Constant Troyon in 1847, was the first American painter to study directly with a Barbizon artist. William Babcock (1826-1899) is credited as “perhaps the first to become fri endly with Millet and to move (about 1849) to Barbizon.” (Baigell 24). However William Morris Hunt (1824-1879) remains the American artist most closely associated with the early Barbizon movement in France. He studied with Millet for two years, from 1852 to 1854, and then influenced other Americans in the style as a painter and teacher when he returned to New England in 1854. Hunt, along with George Inness (1825-1894), Homer Dodge Martin (1836-1897), and Alexander Helwig Wyant (1836-1892) were the late-nineteenth-century precursors of what was to become known as the influential American Barbizon school of art. Inness was especially influential because of the popularity of his paintings, which viewers perceived as being skillfully executed, poetic, and mood-conveying landscapes. Breaking with previous American and European art traditions, these were four of the innovative artists who developed a new movement in American landscape painting, preparing the way for an eventual emergence of modern art in American salons, galleries, and popular culture. Following French-Barbizon painters, American artists began to paint landscapes that depicted changing seasons and transients skies, capturing the light, mood, and mystery of nature. The Americans developed a ‘tonalist’ technique characterized by simplified compositions, blurred forms and a limited range of colors. Paintings of the Barbizon school were very popular with American collectors of the late 19th and early 20th century. In the late 19th century many American artists were traveling to France in search of new subject material and the company of other inspiring artists. Upon returning home, they were eager to replicate their experience, often incorporating techniques they picked up abroad into their portrayals of American subjects. American artists absorbed French Barbizon and Impressionist styles, and they sought to create in this country their own versions of the art colonies they had experienced in Europe. In 1899, while traveling through Connecticut by train, Henry Ward Ranger (1858-1916) was taken by the countryside, comparing it to the Barbizon area in France. 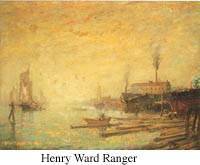 Eager to establish a collaborative artistic environment similar to that which he had seen French artists enjoyed, Ranger encouraged other painters to follow him to Old Lyme, and the ‘American Barbizon’ was born. Ranger and a group of ‘bohemian’ painters often stayed at the boarding house of Florence Griswold, and The Griswold House became the center of colony life. These early Old Lyme artists practiced an art very much influenced by the French Barbizon painters, favoring darker tones, heavy impasto and featuring woodlands and scenes of country life. Unlike many of their French counterparts, however, they did not emphasize the hardship of work on the farm, preferring to present their New England subjects in a romantic vision of rural labor. Ranger and his group in Old Lyme including Carleton Wiggins (1848-1932), who often placed animals in his landscape scenes, were frequently described as Tonalists, and Henry Ward Ranger was considered as the leader of the Tonal School in America. Also associated with American Barbizon is Dwight Tryon (1849-1925), who was working in the style by 1880, and Thomas Bigelow Craig (1849-1924), a Pennsylvania painter whose specialty was bucolic landscapes with grazing cows. Because the Barbizon artists advocated a direct study of nature, they helped prepare for the subsequent development of the Impressionist school and for modernist artists including John Marin (1870-1953) and Arthur Dove (1880-1946). The Barbizon movement in America reached its height in the 1880s and 1890s, although some artists continued to work in the style into the 1920s. By Teta Collins and Lonnie Dunbier. Credit for much of the above information is given to: Kimberley Reynolds, "Illustrated Dictionary of Art Terms"; to the website of the Florence Griswold Museum; to Matthew Baigell, “Dictionary of American Art”, to LymeLine.com, the website of Old Lyme, Connecticut.